Although we planned on making our way to visit our new baby niece this weekend, freezing rain forced us to stay fairly close to home. 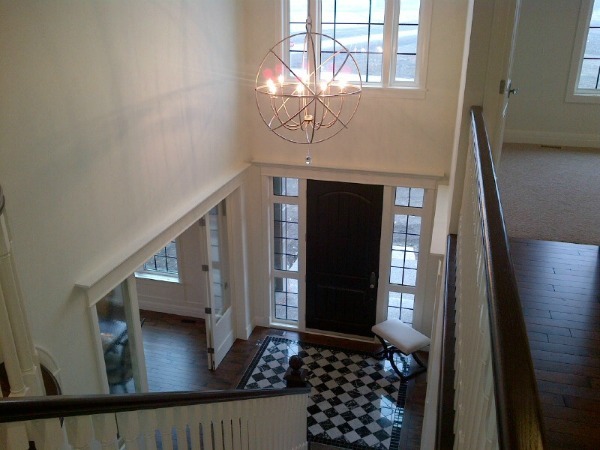 I was itching to get out of the house for a bit, so my husband and I decided to check out a few showhomes we hadn’t been through yet in our area. Although there are few homes I walk through that I absolutely fall in love with, I often find there are parts of homes or certain features that give me ideas for client projects, our current home, as well as the one we plan on building within the next couple years. The first home we visited had great flow, and we particularly liked how open the kitchen, breakfast area, and living room were to each other. It would be the perfect space for entertaining. We also liked how the stools tucked neatly under the island. The warm color palette was also appealing for the snowy/rainy day we were having. 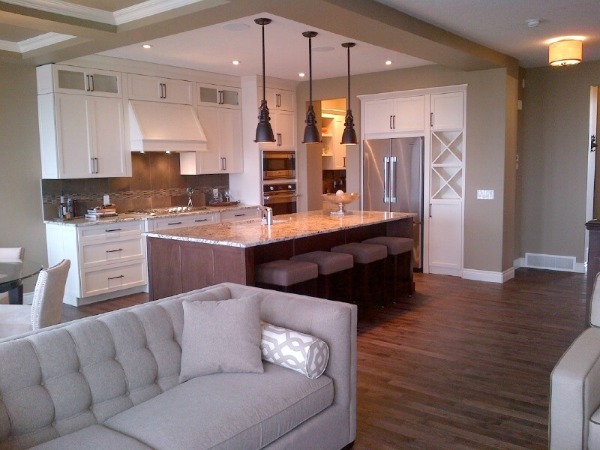 Although I tend to like light and airy spaces, they can feel cold in our Canadian climate. Achieving the perfect balance can be tricky. The second house we toured had a different feel all together. The kitchen was my favorite by far. 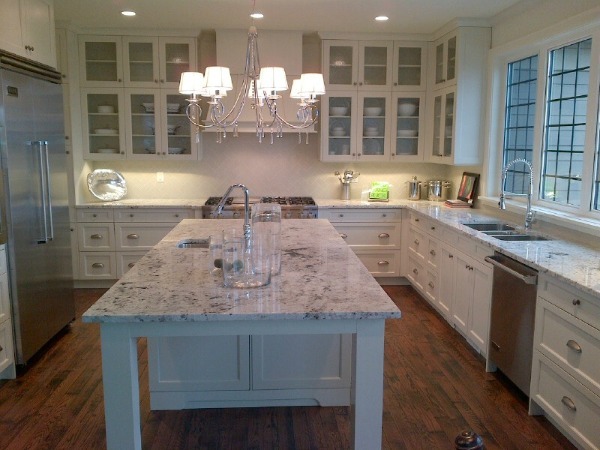 I loved the marble countertops and white cabinets (not so much the nutmeg floor). The backsplash was a simple subway tile, but the herringbone pattern it was installed in really elevated the look. The living room was next to the kitchen. Although it had many components going for it like panel detailing, built-ins and a fireplace, the scale of everything seemed a bit off. A large area rug would’ve helped this space out a lot. 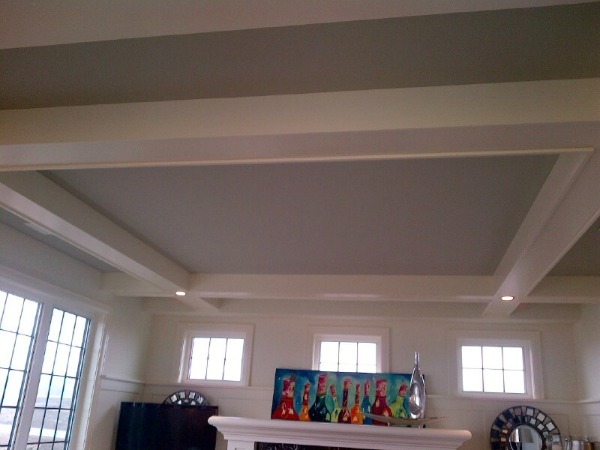 We did like the coffered ceiling and the soft blue-grey color that was painted in the recessed portions. This home had a beautiful view looking down the stairs. We both really liked the orb light fixture, which I can imagine would look stunning through the upper window at night. Another room we liked aspects of in this house was the combination of the master bathroom and dressing room. Although the layout of the bathroom seemed a bit strange, the finishes and detailing were gorgeous. 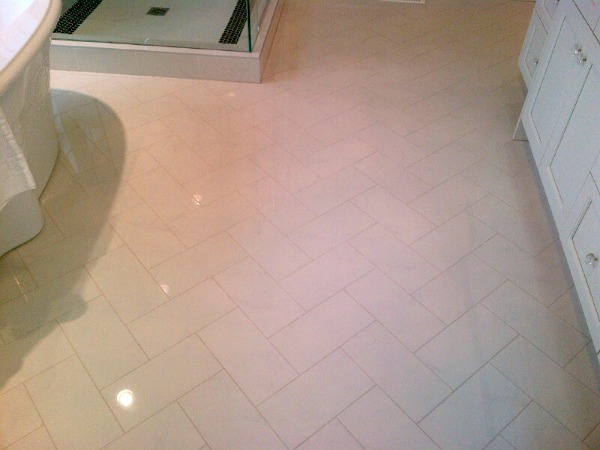 The interesting herringbone layout of the tile was carried on here as well. The built-in clothing storage cabinet in the adjoining dressing room replaced the need for a large dresser in the master bedroom. I like the idea of having all my clothes in one area for sure. The final home of our tour was a bit disappointing. 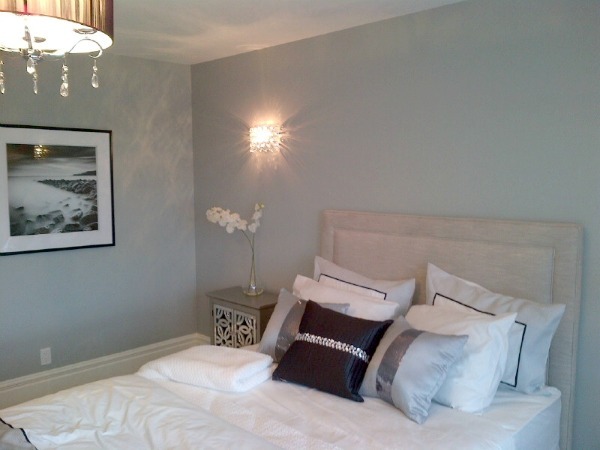 However, I was really drawn to the calming blue-grey color in the master bedroom. Pretty, right? 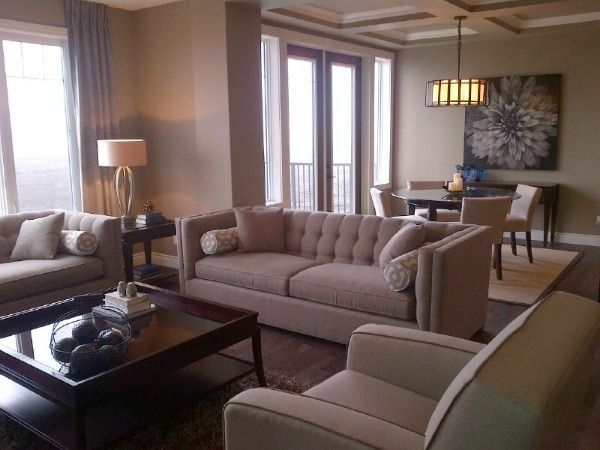 Have you visited a showhome recently? What have you seen that made your own wish list? Anything about these homes we toured that caught your eye too? I LOVE marble counter tops – especially on an island. Coffered ceilings are on my house bucket list. I will have a house with them sometime in my lifetime! They’re a nice touch, especially to dining rooms where there isn’t a whole lot else going on in many cases. Hi Shauna, I think your right they all have elements that are quite nice. The second kitchen is beautiful, but I agree the floor is far to rustic for the refined elegant cabinetry, if they had darkened it a few shades it would have for sure topped the list! Love your blog BTW!!!! Totally agree. A nice deep oiled floor would look fantastic in that kitchen. Thanks for the kind comments! 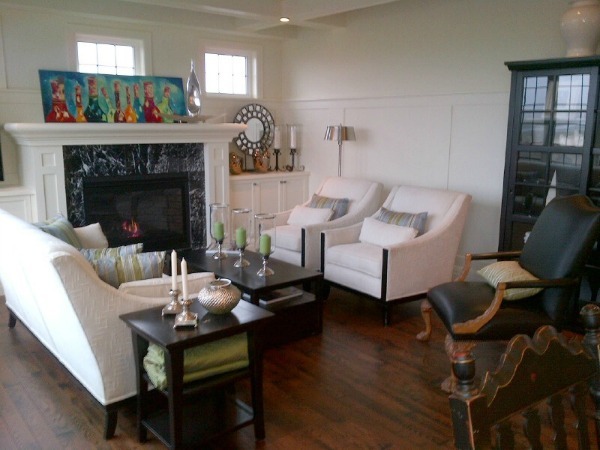 Lots of things I love about these homes, thanks for sharing. 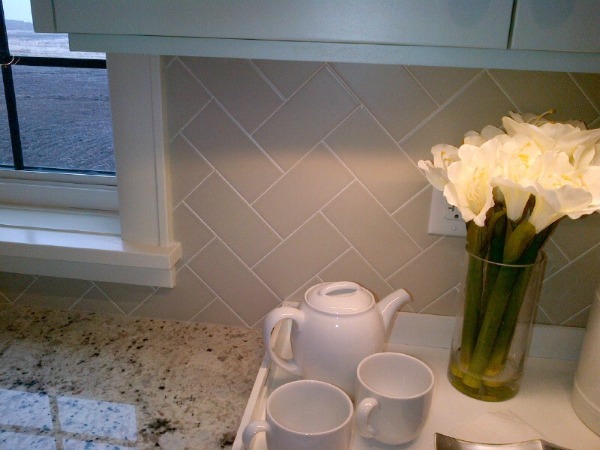 Love that herringbone backsplash, thanks Shauna! I wish I had a space so well-designed! My house a hodge podge of whatever works. Not exactly attractive! I haven’t gone to a show home in forever! Thanks for the tour! I love how everything is so light and bright!